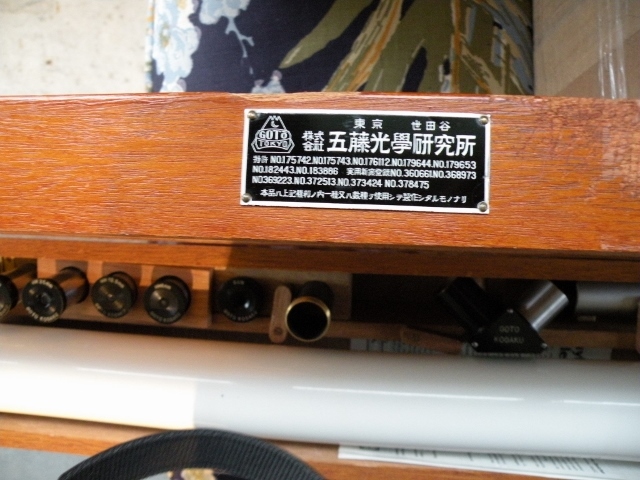 In a thread on using Goto Optical Co.'s case labels to help in dating the manufacture of these telescopes we come across two different Goto's in the company logo. Interesting story. I apologize to all our Japanese friends for what follows, but it is an attempt to characterize what's going on. First a brief Japanese language primer. Like pretty much all language, we have vocalizations that have meaning. When we attempt to capture these vocalizations with stylus and clay, some form of pen and ink, or a digital document on a computer with keyboard, we come up with a phonetic system of sounds represented by words, broken into syllables, made up of letters. In Western culture we have the Romance languages, which I used to think had something to do with that term speaking plainly. I now think it has to do with our alphabet evolving out of Roman culture. In US English we have a modern alphabet of 26 letters (52 counting case). We make little use of punctuation except for ending sentences and contractions. We can make a lot of words (current main entries in Miriam-Webster is ~263,000). Japanese written language evolved from Chinese ideograms. They look nothing like our Romanized letters, and are much farther removed from them than say Cyrillic or Greek, and closer to say, Arabic. In a gross sense we can call these characters 'kanji'. In actuality there are three different "alphabets" that make up the words, syllables and letters in Japanese. The first and second are very similar in meaning, and are 50 characters each. They are Hiragana and Katakana. There are then another 2,000 or so additional 'kanji' that are considered necessary to be taught in school to cover most every day reading of documents. For Westerner's the only way to 'know' these is through memorization (computers and internet changes that). While no formal count exists, a good estimate is ~50,000 total characters. Enter the Portuguese, who in roughly 1603 created the first Japanese-Portuguese dictionary, Romanizing the Japanese language primarily through phonetics. Many others followed. These translations are called 'romaji'. In modern times there are four romaji that are in use, but let's just focus on the two primary. The first was created by an American doctor/missionary in the 18th century named James Hepburn. It is known as the 'Hepburn romaji'. The second is the official transliteration of the Japanese government today and it is known as 'Kunrei-shiki' romaji. Japan entered a period of modernization with the initiation of the Meiji Restoration in 1868. Trade agreements needed to be in writing and Hepburn romaji provided a means for that (as far as US government was concerned). The US occupation ended in 1954 and the Japanese government moved away from the Hepburn romaji and made the Kunrei-shiki romaji the official romaji going forward. 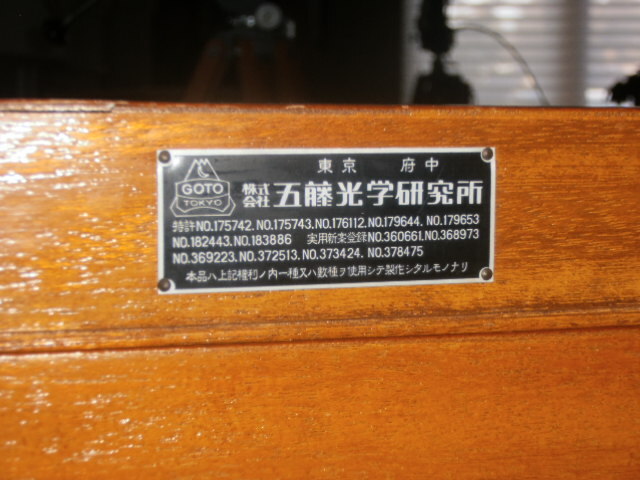 For whatever reason, Goto Optical Co. continued to make use of the GOTo with macron over the little 'o' in the logo until they shuttered the Setagaya factory in 1963 and moved operations to Fuchi. From that time forward the logo looks like that in the picture below. Note that the three character in the first line to the right above mean Setagaya and the two characters in the first line to the right below mean Fuchi. Hepburn romaji is still in use today in documents like passports to aide in pronunciation. It may be that Goto Optical Co. continued to use it throughout the 1950's because they started to market their products outside of Japan. Two additional comments. First, a standard form of romanization was considered so important to the Japanese government's efforts to modernize that James Hepburn became the first American (and only the second foreigner) to be awarded the Order of the Rising Sun (3rd Class) in 1905. Secondly, and one of the primary reasons for going through all this, is to encourage you to make use of the translation capability of Google Translate and Chrome browsers to explore Japanese kanji-based websites with perhaps a little better appreciation of what it is you're working with. Japanese language entry on a keyboard is typically in Kunrei-shiki romaji, which Japanese schools teach from 4th year on. To use it you need to know it, which most of us don't. When entered, it is converted to kanji characters which most Japanese normally read. Google Translate and Chrome can automatically take English (or whatever other language you're working in) and get to the kanji directly (although the translation will be some degree off from correct). Most of the Classics discussed here are from Japan. There's a whole 'nother world of information a few transliterations away. The tools exist to get you there without memorizing thousands of kanji (but you'll learn them anyway cause you're going to see many of the same ones over and over again as you visit more and more Japanese sites). Edited by Stew44, 21 March 2019 - 02:51 PM. Thanks for the very interesting and informative post! I'm no Japanese language expert, but the proper modern romaji would be GoToU for 五藤. This is correct and you can see this in the second and third large font characters in the case plates above to the right of the logo. Seizo Goto-san 'spelled' his name a little differently than other people named Goto so the characters you put forth are not the first that would show up in a conversion to kanji. Someone entering the Harigana into a computer would see a different kanji and need to cycle through them to get the right characters (done with a space bar once the characters are 'suggested' (and Japanese translation has been enabled on Windows 10 anyway)). As I understand it, word processing romaji is called 'wapuro' romaji but really just Kunrei. Edited by Stew44, 21 March 2019 - 02:55 PM. Since the earlier Hepburn romaji macron "O" reflected the long vowel OU sound, I can only guess that Goto san, and perhaps others also bearing that surname, decided to stick with the four letter romanization even after Hepburn was abandoned? Apparently, other romaji variations of the 五藤 surname include Gotoh, in addition to Gotou. Edited by Boom, 21 March 2019 - 10:29 AM.